This looks fantastic! I love Compari. I just might have to double it! Alright. You've done it. This is enough motivation for me to special order my second bottle of Maraschino Liqueur. I love it, but I've just been putting it off. I think I might be judging that contest on Monday. 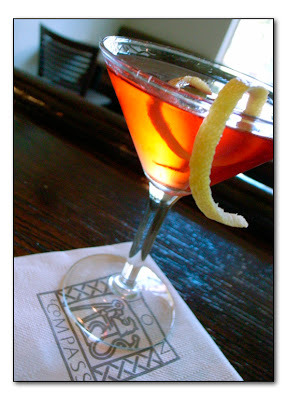 I agree that the main challenge is to ease people into Campari, rather than just to come up with a good drink with it. So I guess a challenge as a judge who likes Campari is to not think every drink needs more of it. You won't have to worry about judging my entry, I didn't make the finals. I'll be interested in the recipes. I think one of the finalists is a limoncello-campari cocktail, which is one of the areas I explored, but I couldn't make it work. My bottle of Luxardo Maraschino Liqueur came today. This cocktail is phenomenal! Everything is balanced very well. The bitters, Campari, and maraschino fuse together and ride happy on the cognac base. It's a shame your entry didn't make it!